The Rails vs. Carroll rivalry has always been exciting. The 2016 meet proved to be no different! The Rails traveled to the Carroll Recreation Center on Thursday, Sept. 8th. The meet started out with Carroll having a lead through the first four events. Following diving, the Rails were up by two points. But the Tigers soon erased the lead over the next couple events. Then during the 500 Free, the Rails took 1st, 2nd and 3rd and regained the lead. 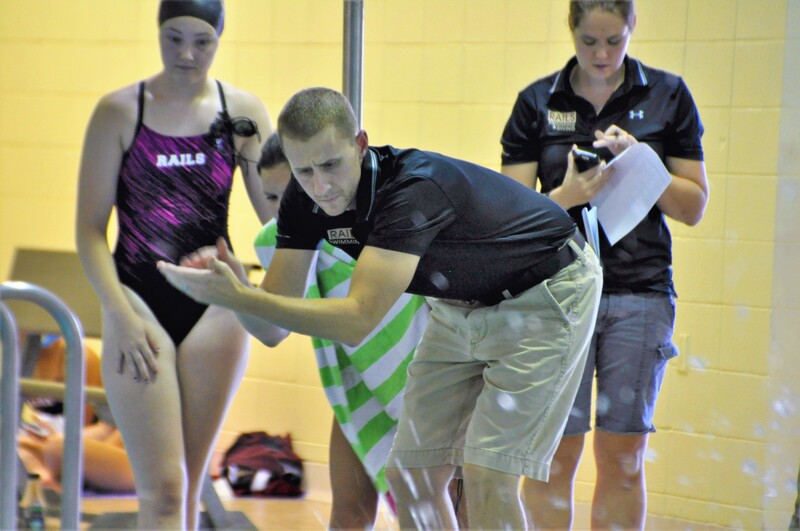 After a couple more rollercoaster events, including an intense 100 Back race, the Rails were up by two points heading into the 400 Free Relay. This meant the last relay was a winner take-all race 400 Free Relay for the second straight year. And the Rails won! The final score was 97.5-89.5. After a meet with so much back and forth, the Rails showed a real strength and a will to win. It was a great moment for the team and sets them up well for the rest of season. The 400 Free Relay of (Trucano, Crady, Dooley, Bennett) swam a season-best 3:58.01 and secured victory for the team! Cat Dooley earned her Sub :60 t-shirt! Below are few photos from this exciting meet. Over 700 pictures were taken that night and are on the team’s photo website, so check them out! A log-in is required.